What is there not to love about Deep Cove?! This waterfront community offers some of the most sought after expensive real estate in North Vancouver as it is one of the only areas in North Vancouver with single family detached residences located on the waterfront. Not to worry as Deep Cove is not only for those with housing budgets above $2 million. There are plenty of neighbourhoods within walking distance to the waterfront, parks and the village that are within the mean of North Vancouver housing prices. I would argue that there is no better place to be on the North Shore in the summer and early fall. You can drive to Deep Cove or boat in and out as there is a Marina and additionally a rowing club. Don’t have a boat? No problem! You can rent a kayak and explore the inlet. If you like to keep your feet on solid ground hike Quarry Rock. You may even run into Dale as she hikes Quarry Rock multiple times every week. For those looking for a slower pace sit on a patio and enjoy one of the numerous hot eateries. A couple of our favourites are Honey’s Doughnuts and Arm's Reach Bistro. 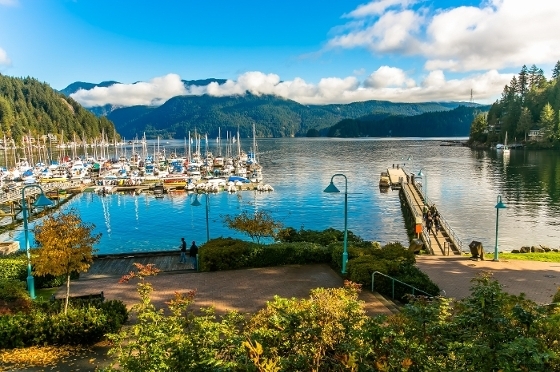 It goes without saying that Deep Cove is an absolute gem and is worth regular visits whether you are new to the North Shore or a live long resident. You never know, you may end up living there!